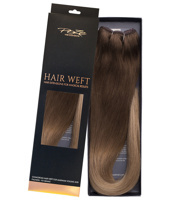 Hair weft extensions are a product that has been on the market long, with its flexibility and the opportunities the product is offering, this has been the preferred choice for many who want to create extensions completely tailored to their own needs. Hair weft is hair that is sewn onto a strip, the hair can also be attached with micro rings, tape, glue, clips or why not sew it on a braid. 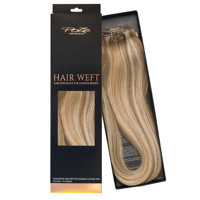 As in ordinary Poze spirit we offer you always a developed version that is different from the crowd, because we have the market fullest hair weft with 110g soft and beautiful hair. 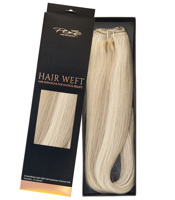 Hair Weft is beneficial in many ways, especially when you want to customize your hair extensions according to your wishes and needs. Hair Weft has long been a preferred choice for hair stylists who work with hairstyles and creates different types of glamourous hairdo´s. You can easily and discreetly attach the hair weft and mix it with your own hair before creating the the desired hairstyle. You get fuller hair to work with and can create heavenly beautiful hairstyles. Order your new hair today and begin your creative journey in the world of hair extensions!